MADE FROM EARTH-FRIENDLY DURABLE PLASTIC. 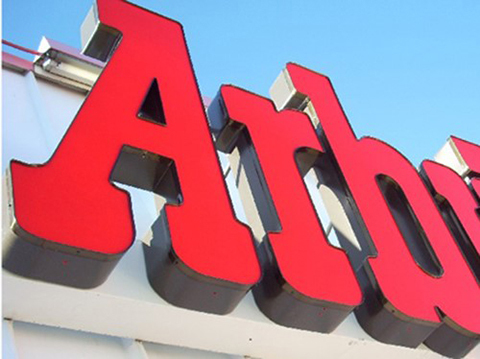 Plastic letters and logos are tough, weather-resistant AND earth-friendly. 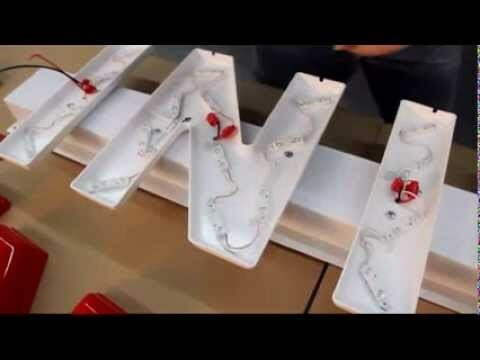 We can dimensionally replicate your custom letter or logo art design. 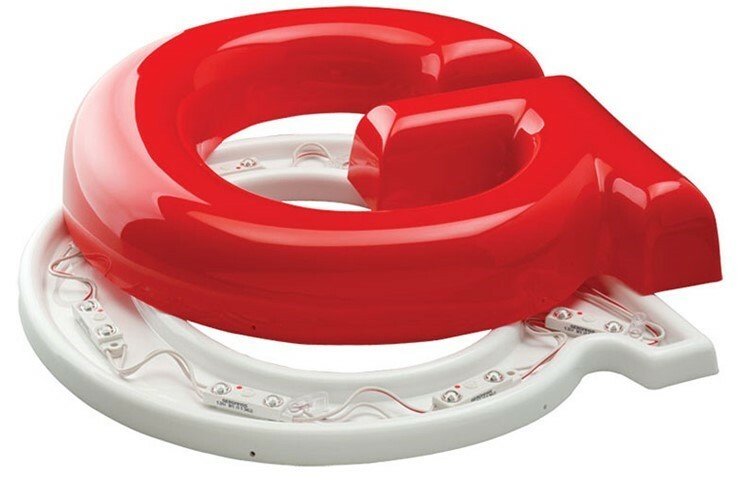 There are standard pigmented plastic colors, or a custom color can be painted to match. 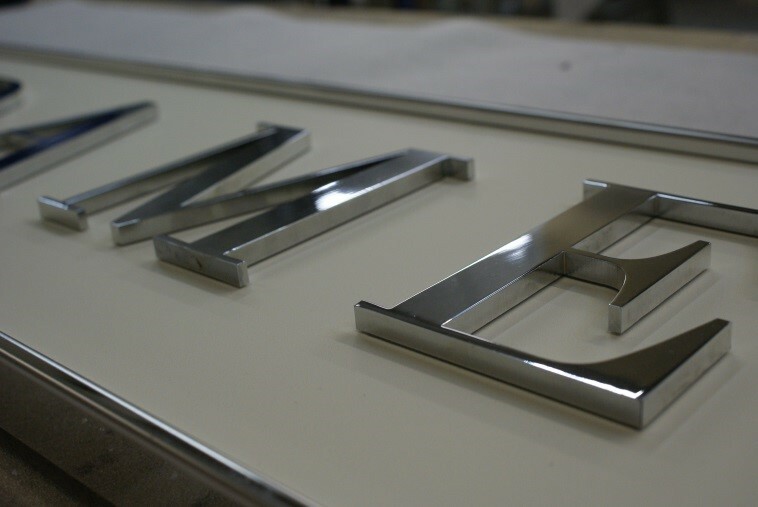 Flat Cut Metal Letters and Logos are made from high-grade plate metal. 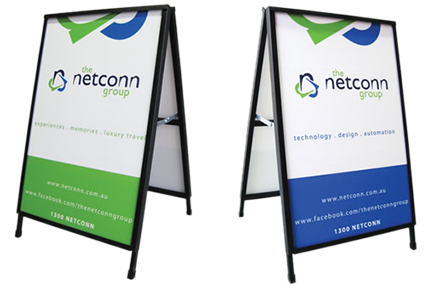 They are stylish enough for your executive boardroom, receptionist area as well as for your signage outside your building. 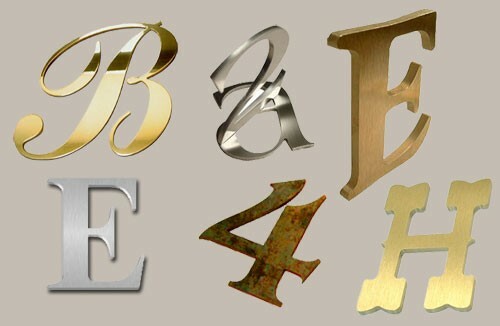 Your logo and name can be produced from Aluminum, Stainless Steel, Bronze, Brass, and Copper. From prime Aluminum, to Stainless Steel, Bronze, Brass, Copper, and Core-Ten® steel, you have many options available to you in finishes and gauges. 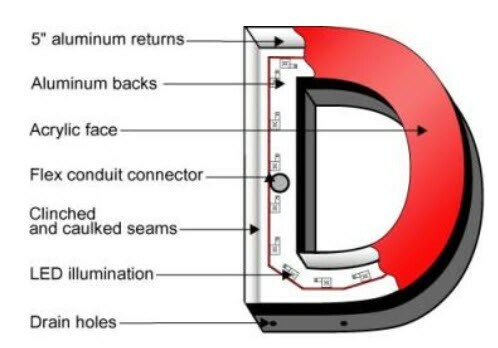 Formed Plastic letters and logos can be lit with either the face lit, edge lit, or backlit option using LED lights which are UL certified. 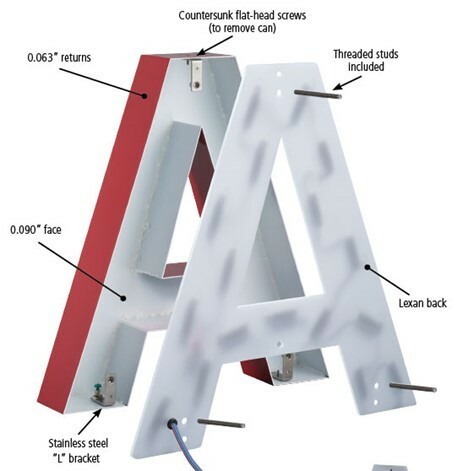 Halo Lit fabricated letters are produced with a removable can to allow for servicing of LEDs. 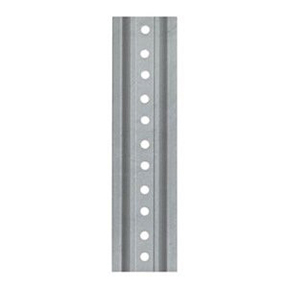 In addition, optional detachable studs create a 1-1/2” stand-off, and allow easy removal of letters from the wall. 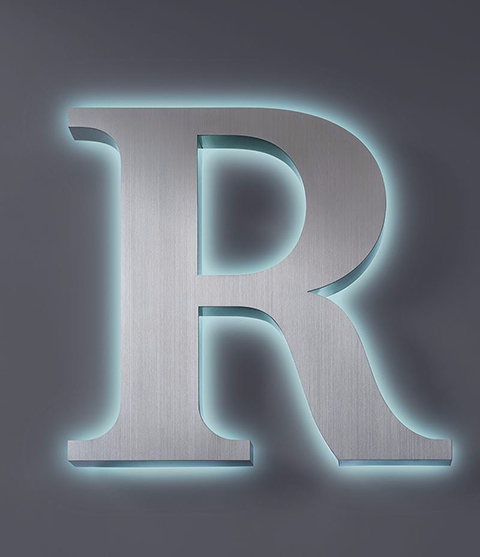 Halo lit letters can be fabricated with or without LEDs. 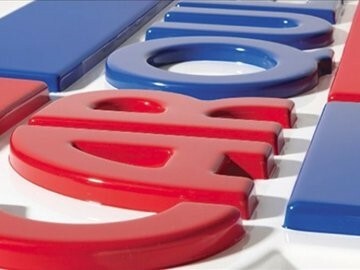 Faces and Can components both are formed with UV stable, CAB plastic that has been certified by UL for lit letters. 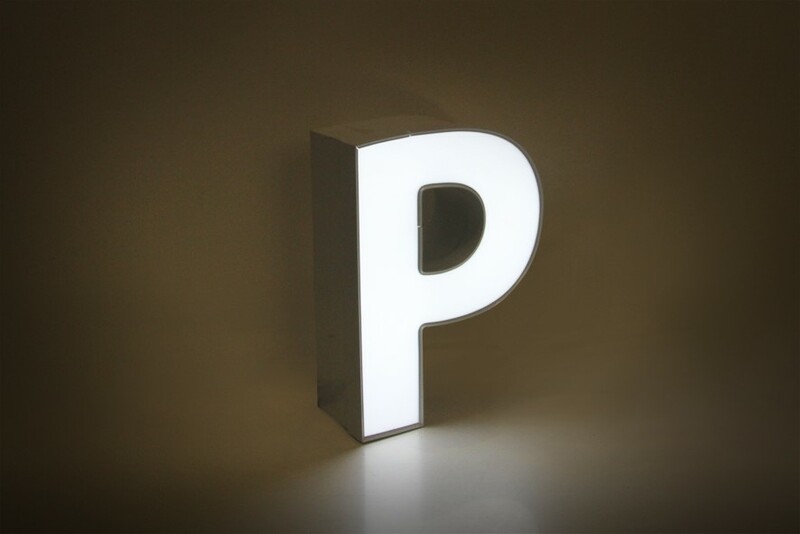 Face lit letters are produced with a translucent material that is custom designed for LED lighting. Typical backs are formed in white to better reflect the LED lights. 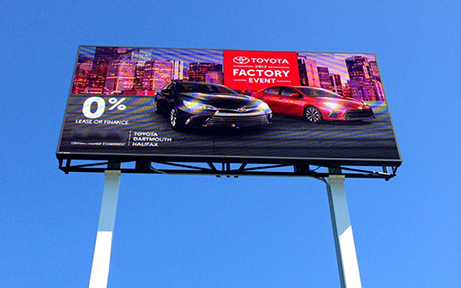 Your LED sign will get your message out 24 hours a day - 7 days a week. 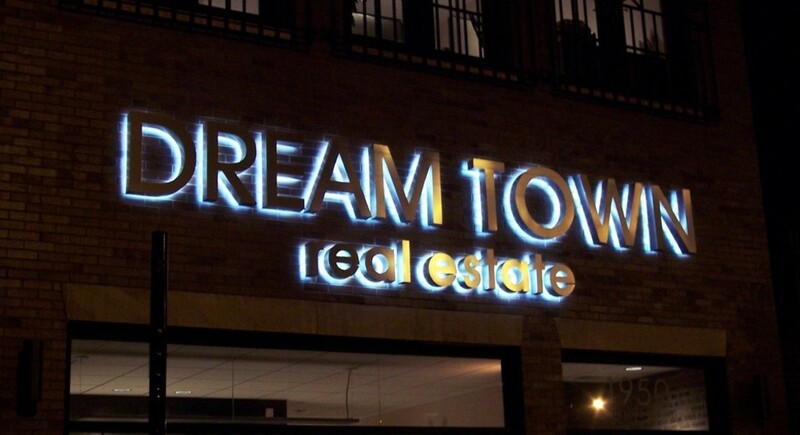 Single color LED signs attract attention with your visual images and animations. 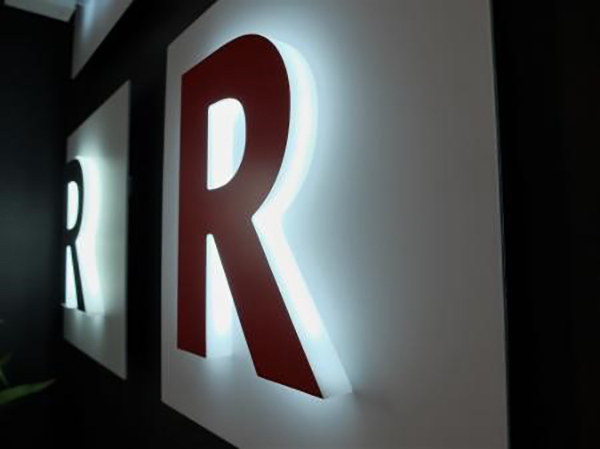 Along with your LED sign you will receive very easy-to-use software that will allow you to create visually stimulating images in just minutes. 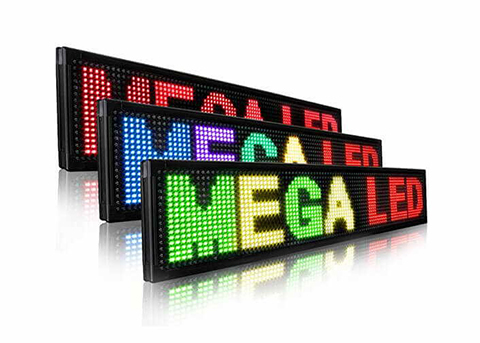 Whether you're scrolling an LED message, animating a graphic or simply changing from one message to another -- these affordable LED signs will get your messages noticed. 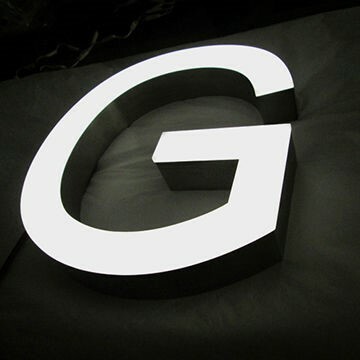 Monochrome LED signs are very cost effective in comparison to full color LED signs. 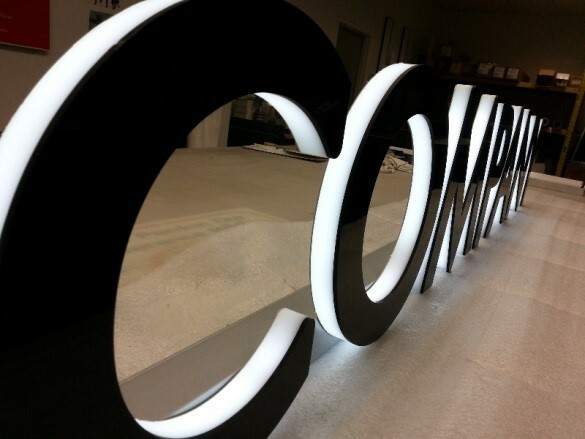 Many organizations, businesses, churches and government agencies allude to monochrome led signs for budget purposes. 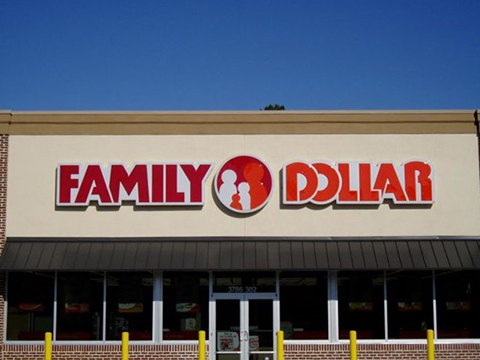 If you are desiring to broaden your communication with your local community by focusing on messaging on a minute by minute or day by day basis, a LED sign might be your solution. 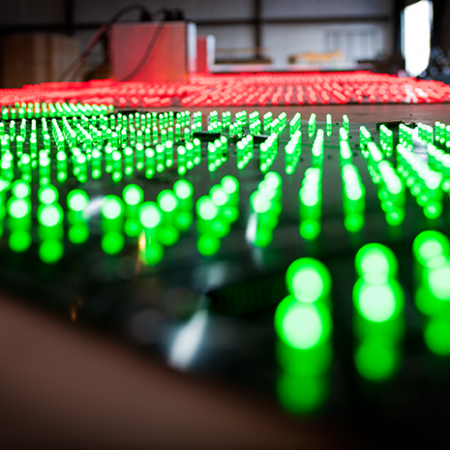 A Laptop along with software training and technical support are included for the LIFE of your LED sign. 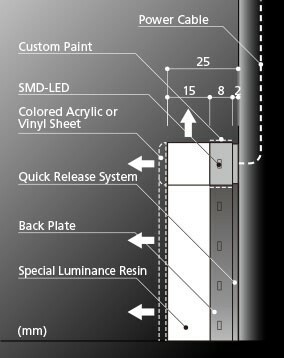 Our LED signs come with a five-year manufacturer's warranty. 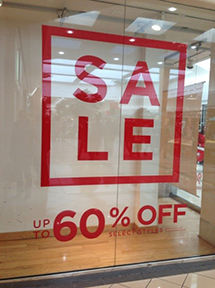 General term for a traditional box type sign made up of a face and back or two faces, with designs ranging from simple plastic faces to metal faces with push-thru letters. 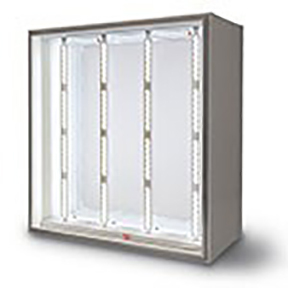 The Standard Conventional lighting or a LED light BOX Sign is designed with style and functionality in mind. 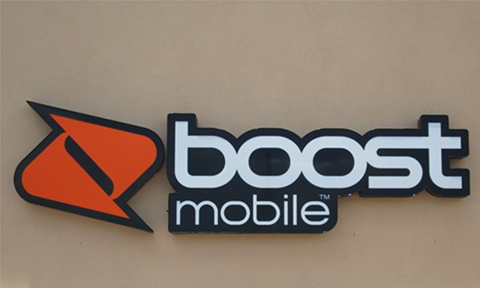 It incorporates all of the features expected in a high quality illuminated box sign. 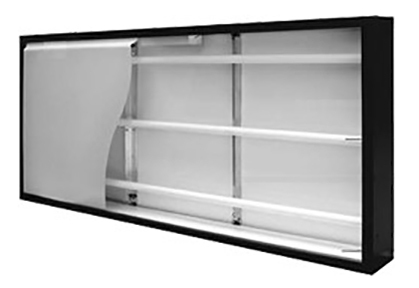 A sleek frame and a durable box is built and constructed to last for many years to come. 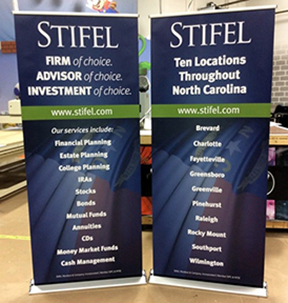 We can customize your graphic options and size options to accommodate your needs according to location and city ordinances. 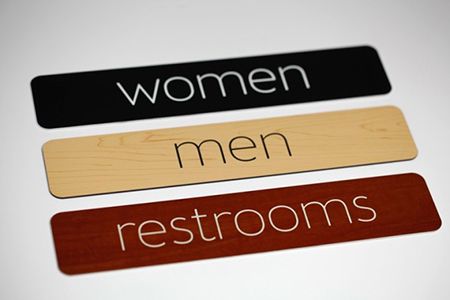 Cabinet signs offer a traditional and sometimes an economical way of showcasing your business name. 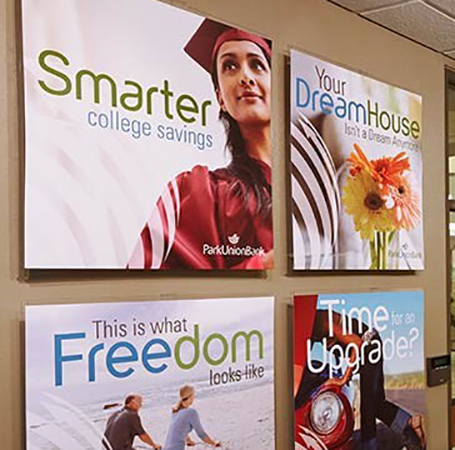 Cabinet signs can have a variety of construction designs from using simple plastic faces to metal faces. 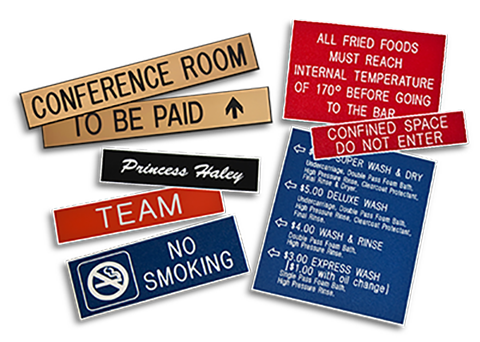 These signs are good for both interior and exterior signs. These signs offer a very nice sophisticated look that you will have to help publicize your name day or night. Industry standard will be LED lights for the illumination. A Billboard delivers maximum exposure to your messaging by way of vehicular traffic on expressways, highways and primary arteries. 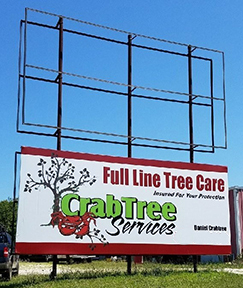 There are various ways to construct a billboard and we will customize to your specifications and allowances by city ordinances. Call us today to begin the discussion as to your specific needs. 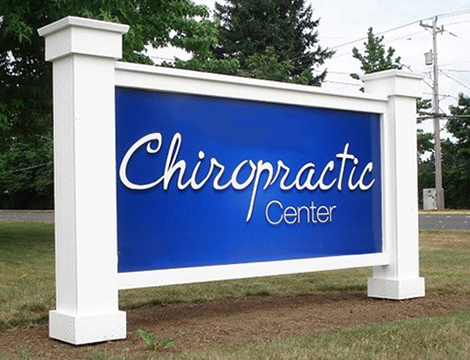 Free-standing ground signs are used to give your business identification closer to a street. 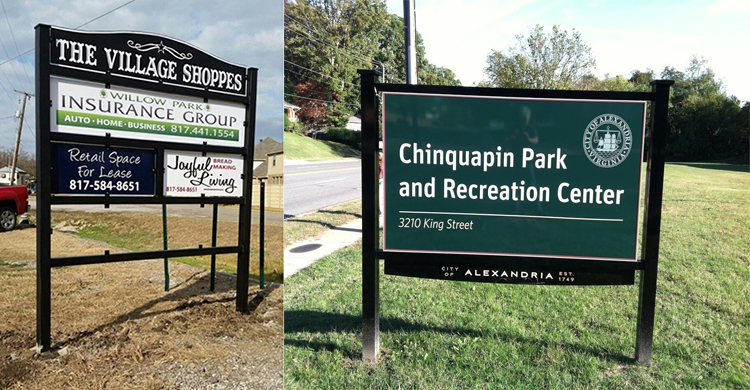 Depending on your business location and needs, a monument sign or a ground sign could fill your signage needs. 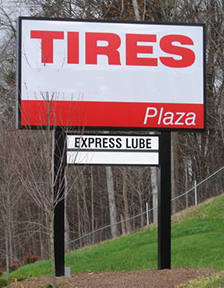 We can also help you in custom designed and constructed shopping center pylon signs. 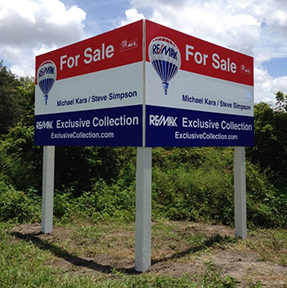 Nothing offers more exposure while selling a property than a real estate sign. 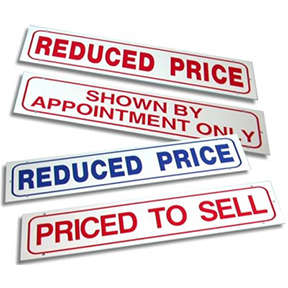 Traditional or unconventional real estate signs would always draw the attention that a property owner, realtor or developer requires. 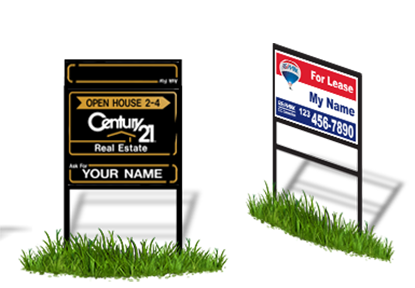 Real estate yard signs convey a simple message with GREAT impact. Choose from one of our customizable templates below to get started. Anyone who’s ever seen a construction site will know just how much signage is on site. The construction or development company will almost always have wooden / aluminum sign or both advertising themselves to generate new leads. Often times they’ll even hang a custom banner from the building itself for the same purpose. The business itself, be it a restaurant or retail store, will undoubtedly have a “coming soon” sign which announces the date it will open. 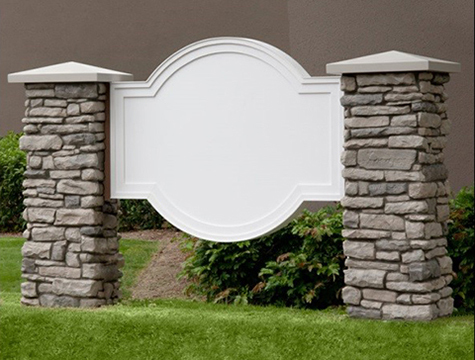 We will build your construction sign to your specifications. 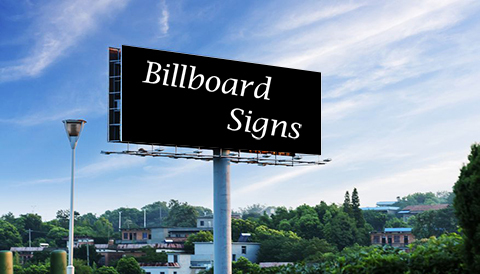 Whether you are looking to advertise your business or notify the passerby of your construction, construction signs can convey the given message. 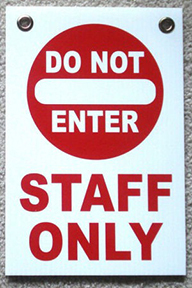 Our job site signs are made to last and printed with high quality UV inks. 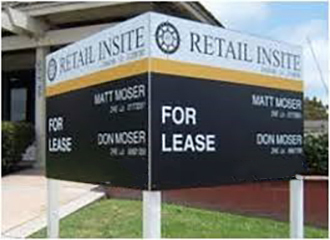 Metal Frame Real Estate Signs are very durable. As named, the frame is metal and the inside is aluminum. 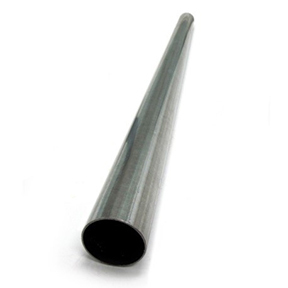 Aluminum is strong, light weight, and extremely resistant to corrosion. 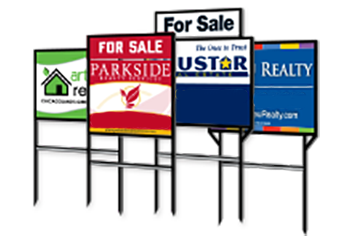 That is why our metal/aluminum signs are ideal for outdoor advertising and make them a great choice for your Real Estate Sign. 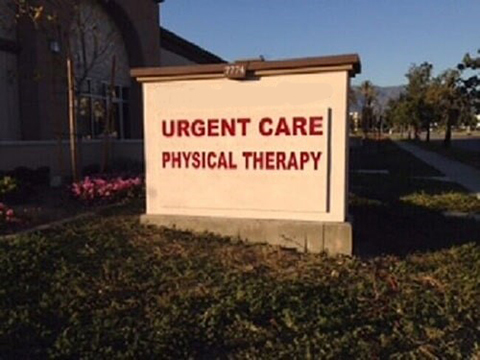 Whatever type of custom aluminum sign you require, this resilient metal will hold up and look great for years to come. Designs can be printed in full color or in just a couple of colors. 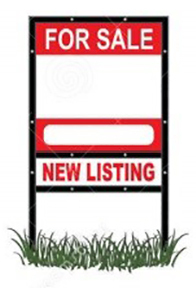 Metal yard signs can also be single or double sided. 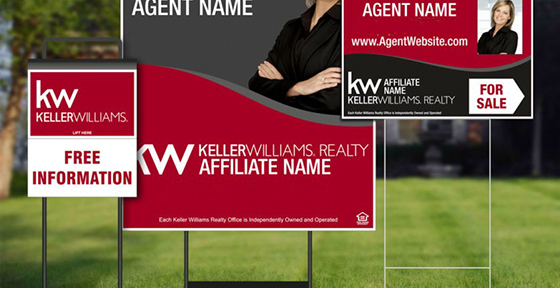 Most realtor metal frame signs are ordered with riders. 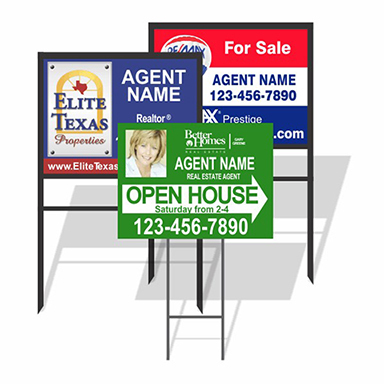 Enhance your advertisement by accompanying your sign with one of our real estate sign riders. 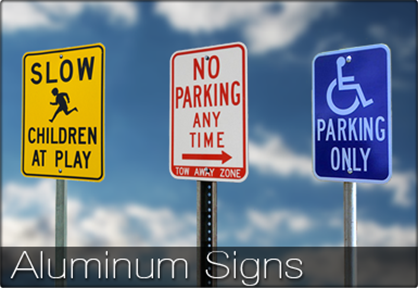 Aluminum Sign Riders are great for conveying the little details without jeopardizing your Yard sign’s contents. 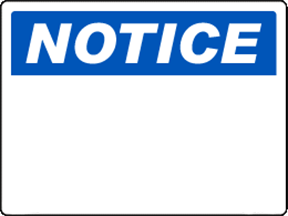 STOCK SIGN RIDERS - 24" X 6"
Our custom yard signs provide a cost-effective way to get your message across. Each yard sign is composed of corrugated plastic, which is a lightweight yet tough material that holds up very well. 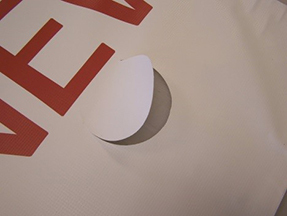 Your signs are weather and moisture resistant although we recommend removing them in extreme weather conditions including very windy conditions. 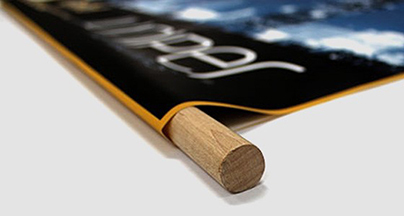 We print with high-quality UV Inks to promote sharper images. 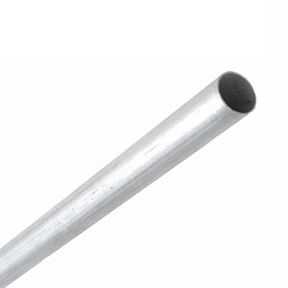 Wire stakes are light enough to be handled and transported easily but durable enough to be pushed into a soft surface. 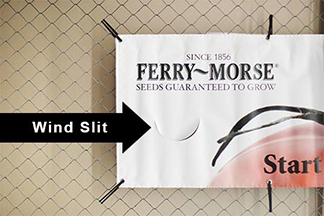 With careful use, wire stakes can be removed with your signs and reused for future display needs. 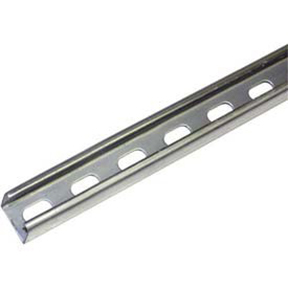 We offer two different versions of wire stakes; standard and heavy duty. 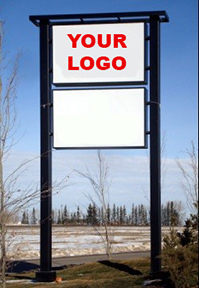 Whether you are looking to advertise your business or notify the passerby of your construction, construction yard signs can convey the given message. 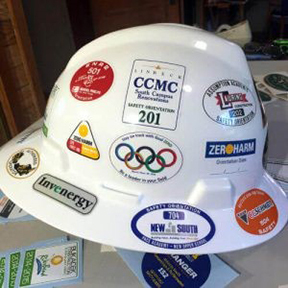 Our job site signs are made to last and printed with high quality UV inks to promote long lasting images even after many years of use. 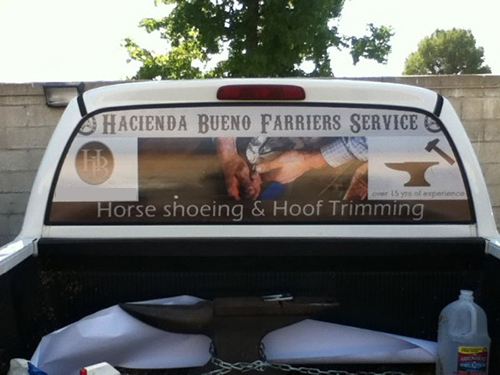 WE WILL CUSTOMIZE ANY SIGN, WORDING OR GRAPHICS. 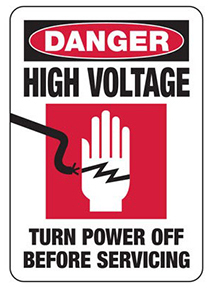 Safety signs help you keep your workers and visitors safe, maintain compliance and avoid hefty fines. 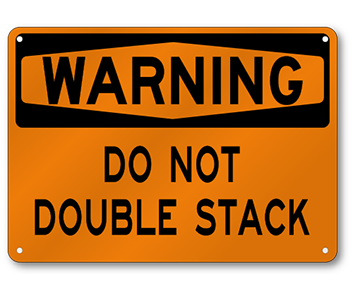 These signs are usually produced on aluminum or 040 aluminum that are made to withstand the harsh conditions of construction or oilfield sites. 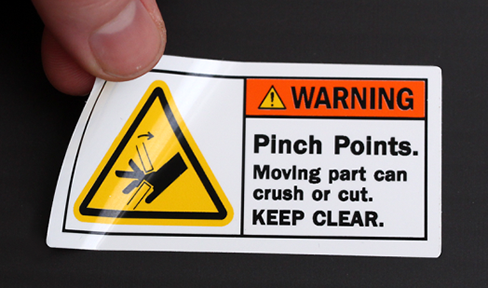 You can also order these signs on decal material when needed. 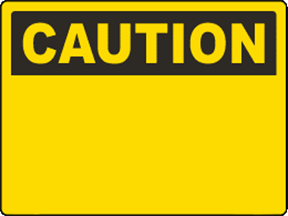 Safety signs such as Chemical Hazard Signs, Protective Wear (PPE) Signs, First Aid, Eyewash & Biohazard Signs, and more are required by OSHA standards and are vital to the health and safety of your workplace. 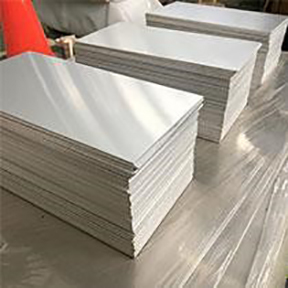 Options for your aluminum signs can include rounded corners and drilled holes for easy hanging on single or double-sided printing. 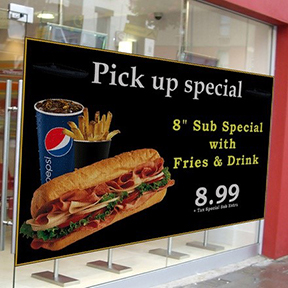 Common sizes for aluminum signs include: 8.5” X 11”, 10” X 7”, 5” X 7”, 12"x12, 18"x24", 2'x2', 4'x4' and more. We will customize to your specifications. 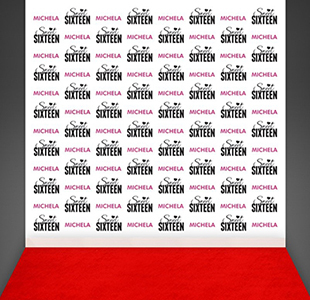 FOR ANY EVENT, OCCASION OR ANNOUNCEMENTS… WE WILL CUSTOMIZE YOUR BANNER TO MEET YOUR SPECIFICATIONS. GRAPHICS ARE AVAILABLE. 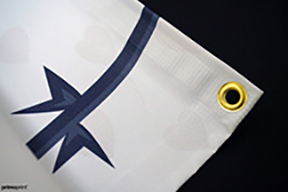 The grommet option will help you to better secure your banner as well as for durability when you put it up either by rope or screws. 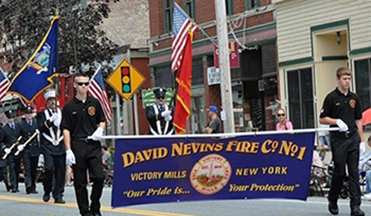 The pole pocket option is requested for parades and sporting events usually to make the banner easier to carry. 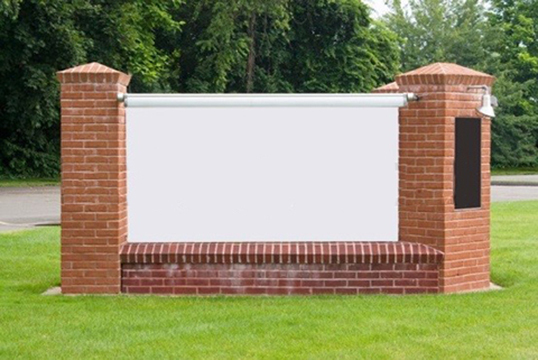 The wind slit option is great for when you are putting up the banner on a fence, an open area, and not against a wall or building. 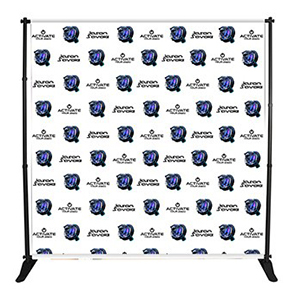 MESH IS USUALLY REQUESTED WHEN THE BANNER WILL BE PLACED IN FRONT OF SPEAKERS OR IF IT IS A VERY LONG OVERSIZED BANNER AND NEEDS THE OPTION TO BREATHE. 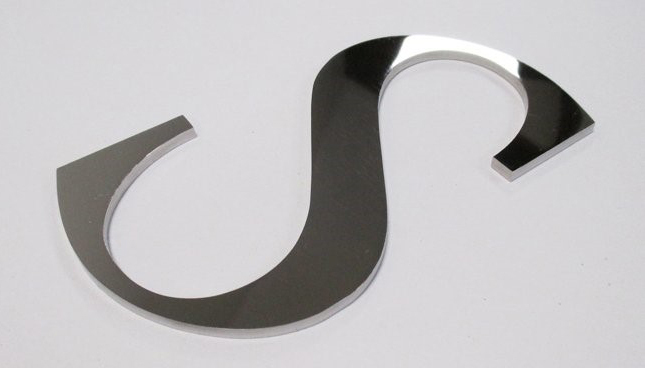 Metal Frame signs come in many shapes and sizes. 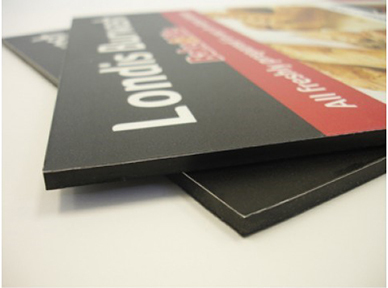 We build Metal Frame signs to fit your needs. 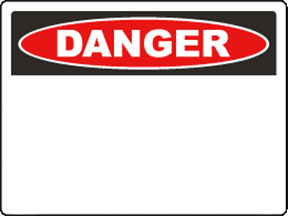 Most Metal Frame signs are filled will aluminum material depending on your particular use. 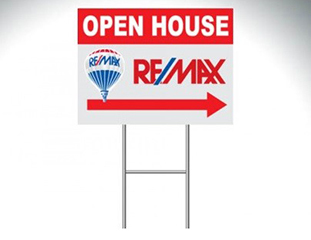 Metal rod A-frame signs are set up at jobsites, along sidewalks and street corners to drive walk-in traffic to real estate open houses. 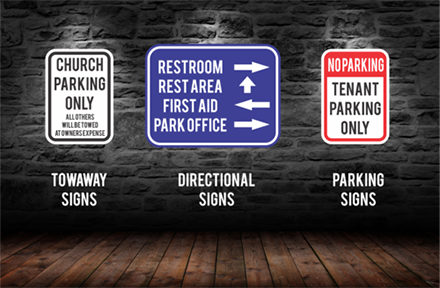 They are also popularly used for temporary directional signs that point visitors toward event parking. 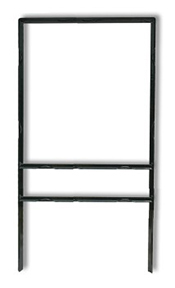 The metal frames are best for outdoor durability and depending on size can be portable. 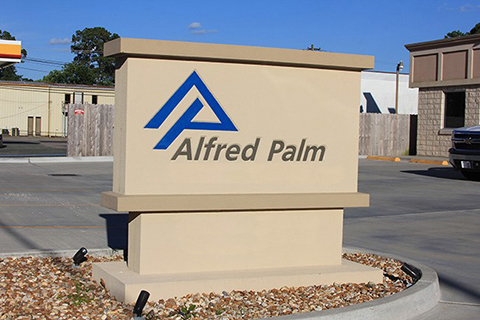 Signs that go with the metal A-frames are printed on weather-resistant aluminum. 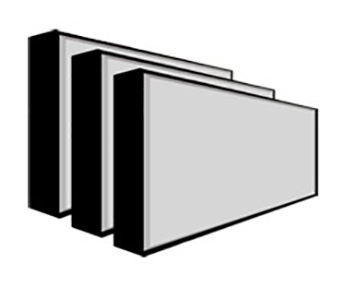 There are two standard thicknesses to your aluminum signs. 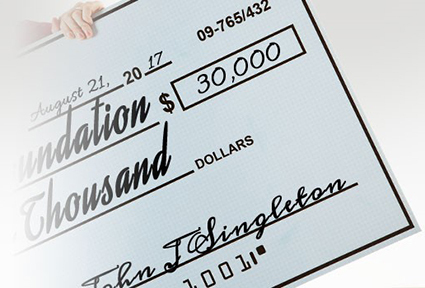 Ask your salesperson for the details. 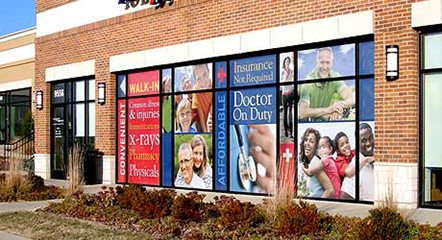 CHANGE YOUR STORE FRONTAGE AND IMAGE WITH WINDOW GRAPHICS. Many people are driving by your place of business not knowing what services you provide or sell. 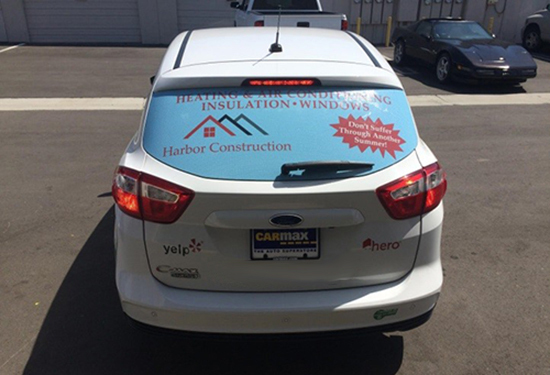 Window graphics will allow you to visually promote your business, communicate to your community and to sell daily as people drive by. 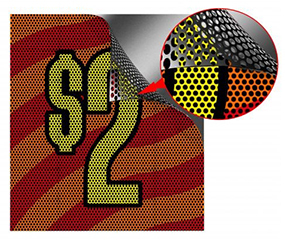 This perforated material will allow you to cover your windows and still allow you to see from the inside of your building out. 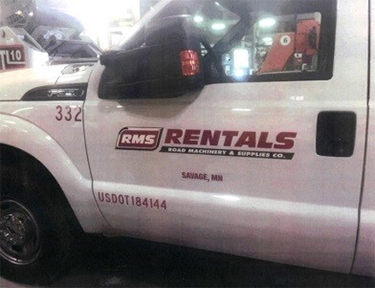 Window graphics are also very popular on company trucks on the back window and back side windows. 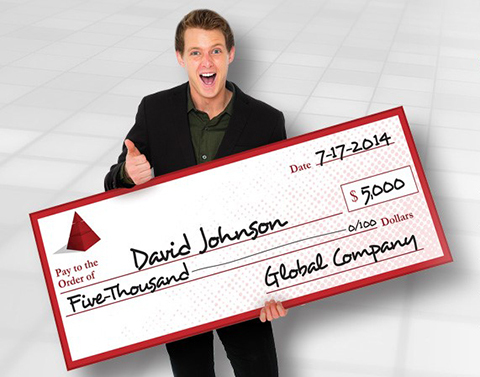 This will allow you to advertise while you are on the street, at a red light or just parked in a parking lot. 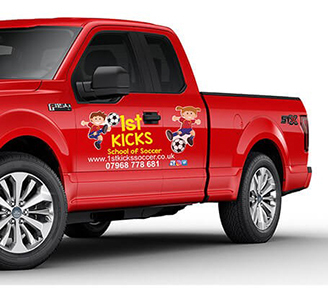 Get the most out of your company vehicles by advertising on them using window graphics. 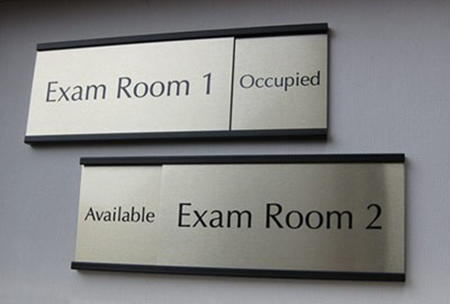 Engraved signs can be used for directional signage or office messaging which will help your clients know where to go or if they are at the right place. 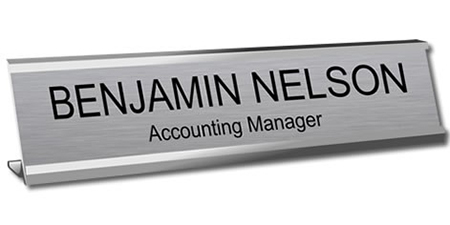 Engraved signs are also very popular to help identify an individuals name and title. DECALS ARE NEEDED FOR MANY THINGS. EASY TO INSTALL. JUST ASK OUR TEAM. Flags are another way to capture your audience passing by. 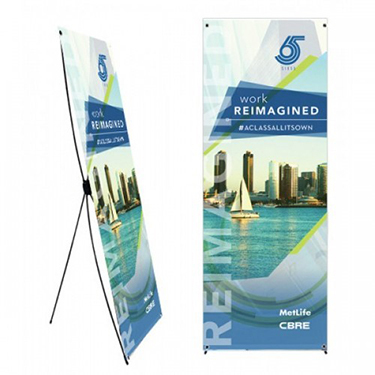 They will draw attention from the street or your curb to your business or to your event. These flags are easy to put up as well as to take down. 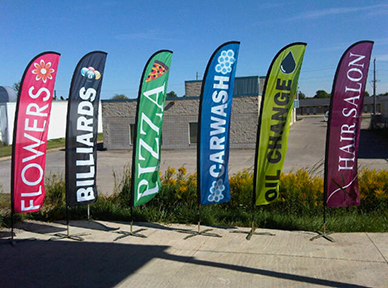 We have several different types of custom flags available. 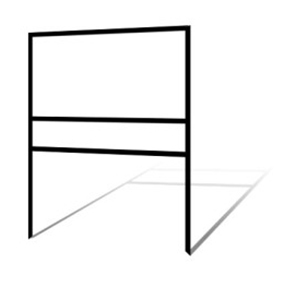 YOU HAVE THE OPTION TO ORDER YOUR FEATHER FLAG IN 3 DIFFERENT SIZES AS WELL AS WITH A STAKE KIT OR STAND KIT. 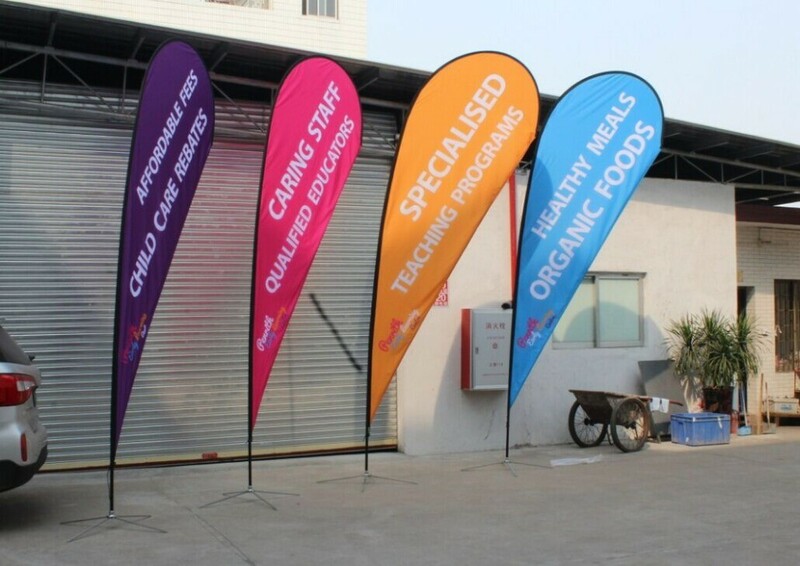 YOU HAVE THE OPTION TO ORDER YOUR TEARDROP FLAG TO YOUR SPECIFICATIONS AS WELL AS WITH A STAKE KIT OR STAND KIT. 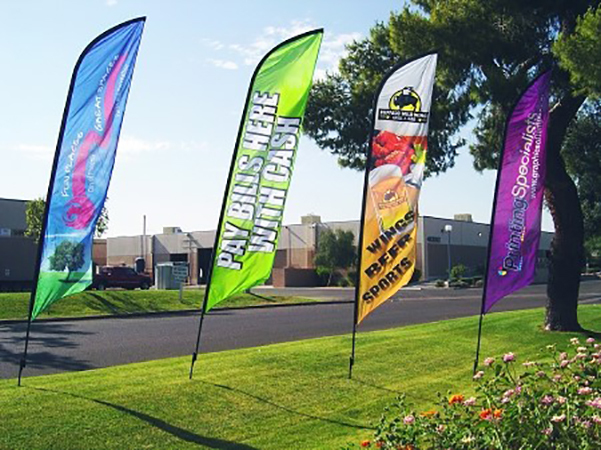 PROUDLY RAISE YOUR CUSTOM LOGO FLAG IN FRONT OF YOUR BUSINESS ALONG WITH YOUR AMERICAN FLAG AND STATE FLAG. 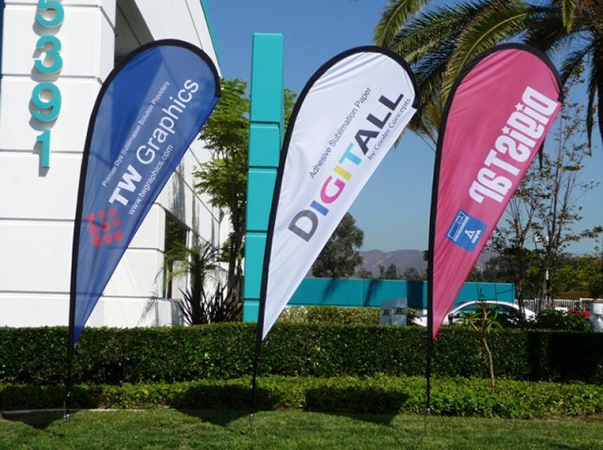 THESE CUSTOM LOGO FLAGS ARE ALSO DISPLAYED HIGH AT TRADESHOW EVENTS AND AT SPONSORED EVENTS. FLAG SIZE IS USUALLY DETERMINED BASED ON THE HEIGHT OF YOUR FLAG POLE. 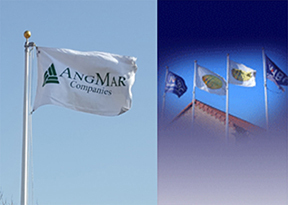 PLEASE ASK FOR A QUOTE IF YOU ARE NEEDING A FLAG POLE INSTALLED. All three options look very professional and will allow you to visually message and brand your business or products with ease. EACH ONE WILL COME WITH A CARRYING CASE. SUPER EASY TO PUT UP! 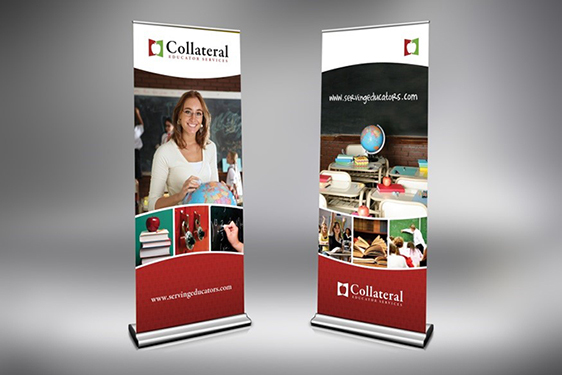 LOGO/BRANDING banners or backdrops consist of one or more logos repeated in a step and diagonal alternating pattern. 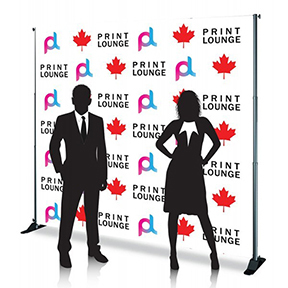 This background design on a custom printed banner helps companies affordably promote and reinforce their brand during events such as media conferences, photo opportunities at grand openings. 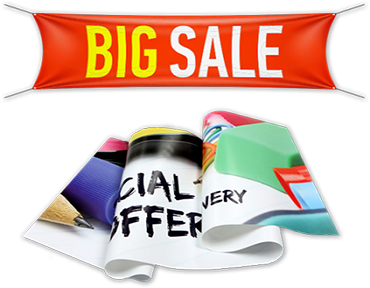 A poster is any piece of printed paper or even on a canvas stock. 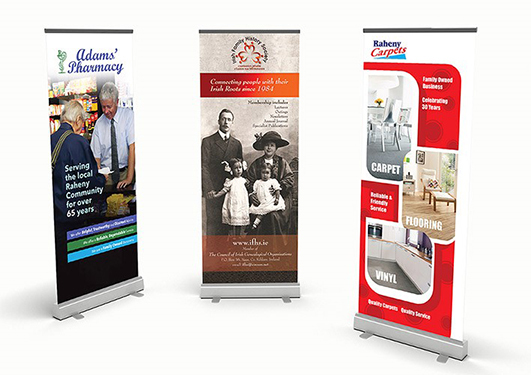 These posters are printed full color on our large format printers. Posters are designed to be both eye-catching and informative. 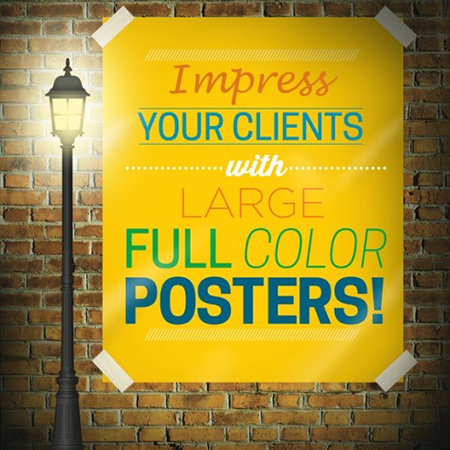 Posters will put your message out in plain view. We will customize your message and size. Your poster can be framed in a picture frame if requested. 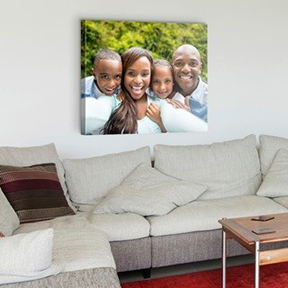 Canvas Posters can be personalized and allow you to have a one-of-a-kind piece of canvas art. These canvas artworks make amazing gifts and make great wall art. Canvases are printed and can be framed as illustrated above. 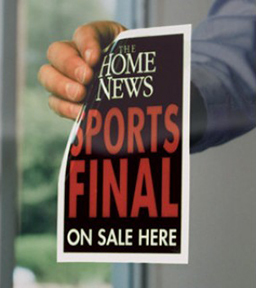 Window clings are great for any marketing & advertising campaigns. 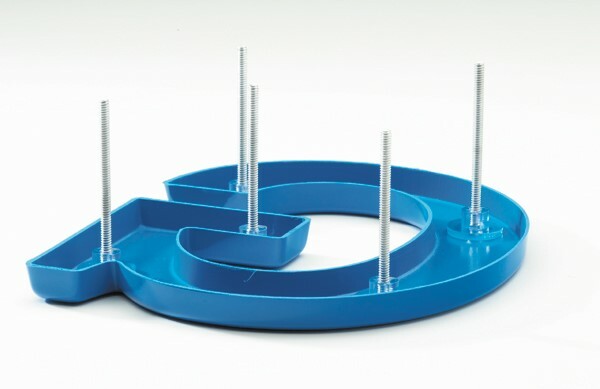 They are very easy to apply and leave no residues when removed from clean surfaces. 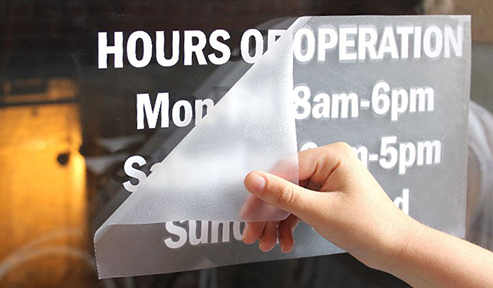 There are two main reasons that window clings have gained quick popularity: they are extremely affordable; and they can be used virtually anywhere. Stick them on your store window, inside the office, or even on a company car window.